We’ve spent some time in class talking about protecting animals that are synonymous with America. Bison, wild horses, burros, and even pigs have been mentioned. I was wondering if maybe there is a bird or two that might count as well. The turkey seems like a no-brainer, but turkeys are plentiful and not really in need of protection. The ivory-billed woodpecker also crossed my mind but they don’t seem to have the same connection to the American experience as bison and wild horses. Then it dawned on me, the lesser prairie chicken! Though they rarely caught the eyes of artists, lesser prairie chickens where certainly in the area when Fredrick Remington and likeminded painters were devoting their attention to bison. 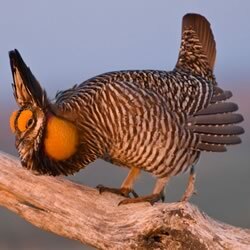 The lesser prairie chicken isn’t actually a chicken. They are one of eleven species of North American grouse. Lesser prairie chickens originally inhabited the entire Great Plains area. Since the 1800s, however, the lesser prairie chicken population has declined by approximately 90 percent. Currently they inhabit parts of New Mexico, Colorado, Kansas, Oklahoma, and Texas. Similar to bison, they need large open tracts of grassland to survive. As such, they are threatened by habitat fragmentation, conversion of prairie to agricultural uses, and droughts. Additionally, wind turbines pose a special threat to lesser prairie chickens. The birds have an aversion to vertical structures. They probably perceive all vertical structures as trees where predatory birds may perch. In fact, the taller a structure the farther a lesser prairie chicken will move from it. This has disastrous effects for hatching young as it forces female prairie chickens to build nests in the open where they are more susceptible to predation. The U.S. Fish and Wildlife Service (“FWS”) is working to conserve the lesser prairie chicken and its habitat. Because the birds need large expanses of open land much of their habitat is on privately owned land. The FWS has established several programs landowners may implement voluntarily, such as Candidate Conservation Agreements (CCAs) and Candidate Conservation Agreements with Assurances (CCAAs). These programs are voluntary agreements between landowners and the FWS to manage land in a way that promotes conservation of lesser prairie chickens and their habitat. Practices encouraged by the programs include incorporating prairie chicken habitat into ranch and farm planning, rerouting infrastructure, restoring native vegetation, removing legacy wells, and installing escape ramps in open water sources. Additionally, in January 2011 the FWS began the listing process for the lesser prairie chicken under the Endangered Species Act (“ESA”).